Like the old joke about where our food comes from  the grocery store!  few of us think beyond our black carts when contemplating where our food goes to, the landfill. Space for landfills near where they are needed is limited, and that growing challenge is the least of our problems. Once kitchen waste and mostly benign household trash is collected and mixed with not-so-benign sources of trash, all of it must be handled as hazardous waste in perpetuity. Buried in lined pits and then hermetically sealed, the resources that end up in them are gone for good. While we all recognize the importance of diverting recyclable materials from landfills, we tend not to think of food and yard waste in this category. But it is. According to a 2003 U.S. Environmental Protection Agency report, food and yard waste make up a full 24% of the municipal waste stream. Like other recyclables, organic matter contains energy and natural resources that are forever lost once mixed and sequestered as hazardous waste. If diverted, they can be recovered and reused through composting. Unlike recycling, which requires huge amounts of energy for sorting, cleaning and processing, composting is a natural process that doesn’t even require much human intervention. Chicago has been collecting yard waste for several years, but other cities have gone further and begun collecting food waste for municipal-scale composting as well. Last year San Francisco began requiring the segregation and collection of all organic matter. Until this happens here (and perhaps even after it does) anyone interested in environmental and sustainability issues needs to seriously consider home composting. My adventure in composting started a few years ago, when I found a standard snap-together plastic compost bin abandoned in the alley. I had always been a bit intimidated by composting and from everything I read, it seemed technical, laborious and complicated. It also had a significant drawback: conventional composting cannot handle processed or cooked food, or fish, meat and dairy products. This limitation bothered me as a matter of principal. My goal was not so much to produce compost, as it was to reduce the amount of waste that ended up in landfills. The solution turned out to be the "bokashi method," an approach used widely throughout Japan, especially in dense urban areas where space restrictions limit the use of conventional composting. Bokashi refers to a mix of wheat bran, molasses, yeast and bacteria (known as "efficient microbes") that essentially pickle food waste, preparing it for composting. 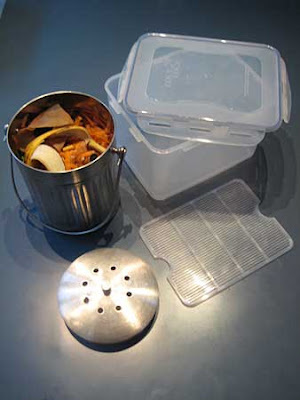 In our kitchen we separate our food waste into two containers: a stainless steel pail for peels, cores, rinds stems, leaves etc., and an airtight container for anything that is normally not compostable or otherwise might attract rats (processed & cooked food, fish, dairy, etc.). The first container gets dumped directly into the compost bin on a daily basis; the second type of food waste is placed in the airtight container, tamped down and covered with a handful of bokashi. After a week or two, when this container is full, it is emptied into a 5-gallon bucket fitted with an airtight lid, a false bottom to allow liquids to collect and an ice-chest spout. Depending on the moisture content of the food waste, the liquid should be drained off (into your garden) every few days to a week. This cycle continues until the 5-gallon bucket is full, generally a month or two. 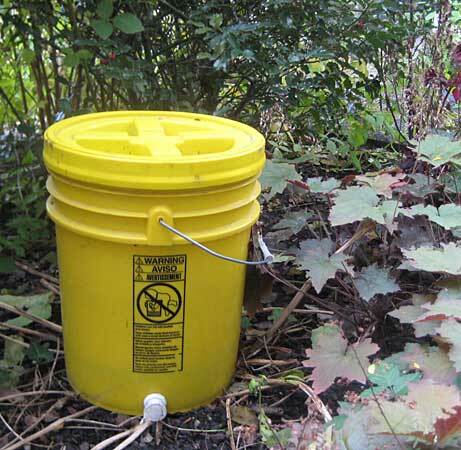 When the bucket is full and has sat for the last two weeks unopened, the contents can be transferred directly to the compost bin. I opened the bucket for the first time with trepidation, but was surprised that there was no offensive odor. The key is periodically draining the moisture away, as this is what creates the rancid smell associated with spoiled food. Over the course of a year, I filled the salvaged compost bin with a random mixture of kitchen and yard waste. It never really seemed to get full; the decomposition process seemed to reduce the volume at the same rate as I filled it, at least until the weather got cold. I never spent much time or effort tending it. Amazingly, when I emptied the bin the following spring, it had produced about nine 5-gallon buckets of compost, all of which I spread on our front and rear gardens. I realized it was time to retire the plastic bin (the sides of which kept bursting open) and find something more substantial. I also wanted to be absolutely certain that it was rat-proof, which the plastic bins are not. 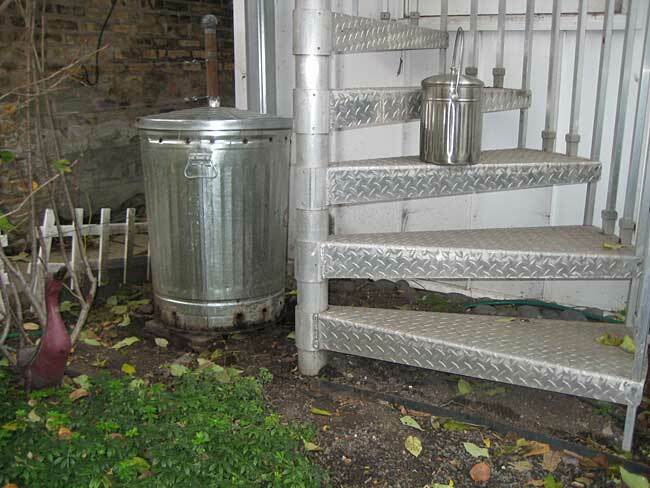 I ended up buying a standard galvanized garbage can with a tight-fitting lid (picture Oscar the Grouch’s home) and perforated the bottom and sides with ½” diameter holes. I found a corner of the garden that gets a bit of sun and placed a 24” square piece of salvaged porcelain tile on the ground, to distribute the weight of the bin so it didn’t sink into the ground. Then I placed the bin up on two bricks, to allow moisture to escape and ensure air circulation around the bottom. As I periodically placed the moist kitchen scraps and bokashi waste into the bin I felt an instinctive urge to throw in some dried leaves from the garden. At the time this just felt right, but later I remembered from my early (and largely forgotten) research into composting that the process benefits from a mix of "browns," carbon-rich material like dried leaves, and "greens," nitrogen-rich materials like vegetable scraps. I continued filling the bin through the fall and winter, as before, but noticed that the bin seemed to fill faster after it was frozen. I ended up making a second galvanized trash can bin to get us the rest of the way through the winter. In early March there was a spring thaw. A few days after it had warmed up, I decided to pitchfork around in one of the bins. As I turned the still somewhat frozen matter, I saw a puff of steam come from the center. After months of being frozen solid, it had heated up and begun composting on its own! Excitement took hold: I went to Radio Shack and bought an indoor-outdoor thermometer with a wireless sensor. I placed the remote sensor in a plastic jar with an airtight lid and buried it in the center of the bin. My intention had been to locate the indoor station outside our bedroom window, which would have allowed me to monitor the compost and exterior temperatures from inside. 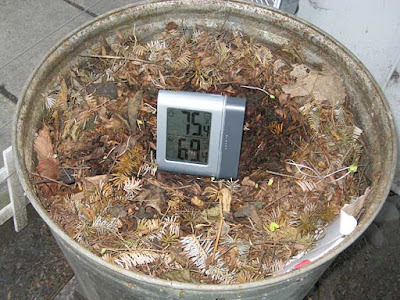 Unfortunately, the metal bin interfered with the wireless signal, so I ended up placing the indoor station in a zip-lock bag and putting it on top of the compost pile, inside the bin. With the material at the perimeter barely thawed (36°F), the temperature at the steaming core was 56°F; over the next week, it rose into the 80s, while outdoor temperatures hovered around freezing. Amazingly, the compost managed to generate enough heat to keep from freezing at night. The bin seemed damp, so I asked my brother Doug for some sawdust from his shop. I turned the compost while mixing the sawdust in and then watched at the temperature shot up to a high of 110°F over the next few days, where it remained for about two weeks. This was twice the exterior temperature at its highest peak. Now that the weather is warming and composting has begun again, I expect to be able to harvest last year’s compost soon. To do this, I use a 3’x6’ steel frame with expanded metal mesh, a security screen removed from a window at my office, laid flat on some 5-gallon buckets. I spread the contents of the bins across the mesh and rake it back and forth until only uncomposted matter remains. You wouldn’t believe the number of wine bottle corks and avocado pits that remain year after year. They are nature’s plastic! The compost is spread on the garden and the rest is placed back in the bin. After this sorting, I expect to be able to put the second compost bin away until next winter. I am really pleased that I have been able to divert all of my family’s kitchen waste (500 pounds during 2009 alone), and a good quantity of our yard waste from the municipal waste stream. Not only does this keep organic material out of landfills, it replenishes the soil in my family’s garden. Fertilizing with homemade compost eliminates the need to purchase manufactured fertilizer, most of which is made from fossil-fuels. Composting is something anyone in the city can do with little cost and minimal effort, and the benefit to the environment and your garden cannot be overestimated. Don’t overthink it, just give it a try. Composting is a great way to reduce unnecessary waste going into landfill. It is also great for your garden, helping to provide natural nutrition for you plants.